The most intricate, and complex quilt design yet.... and my current favorite! I LOVE Baltimore Album quilts. I love the sweet motifs, the strong colors and the delicate borders. If I had 30 years and lots of patience, I would love to make one of these full size. However, the originals are usually done with lots and lots of tiny fabric pieces, each HAND appliqued on a background to form the designs. Thank goodness our mini version is WAY easier. The individual motifs have been beautifully embroidered for you, on 400 thread count bleached muslin. You will cut and join the squares, add embroidered borders, backing and quilt. These are the most complex designs I have digitized to date, and I am so excited that they turned out so beautiful. Those very very tiny leaves are a true testiment to the quality of stitching that the Happy embroidery machine is capable of producing. Finished quilt measures 6 3/4 x 5 1/2 and makes a stunning wall hanging! 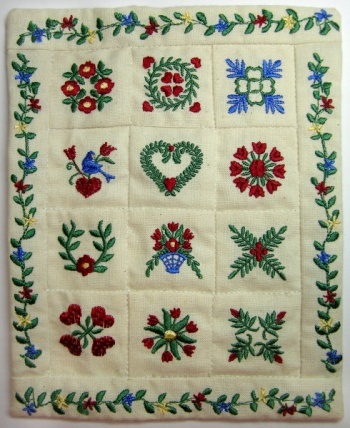 Kits will ship July 15th and can be combined with other quilt kits to save on postage. Online class is scheduled for October 2.